Black Scholar Of The Civil War Asks: Who's With Me? The Civil War ended slavery in America. So why, asks author Ta-Nehisi Coates, do African-Americans, who benefited most from this crucial turning point, take so little interest in the conflict? Coates, a confessed Civil War obsessive, wrote an essay for The Atlantic titled "Why Do So Few Blacks Study the Civil War?" 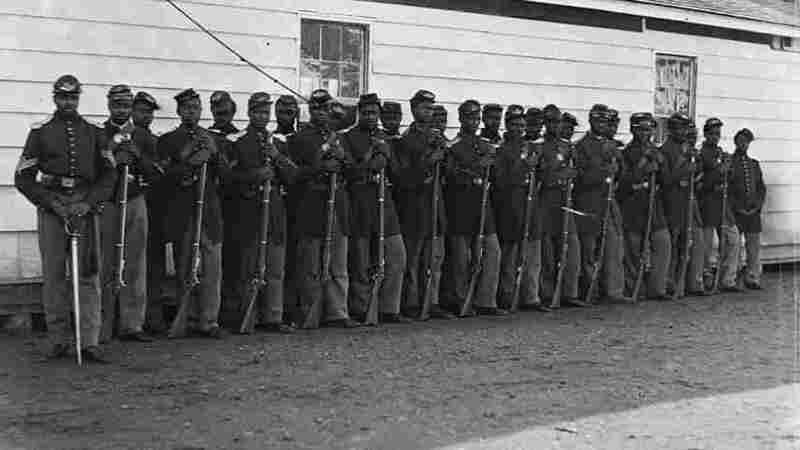 Soldiers of the 4th U.S. 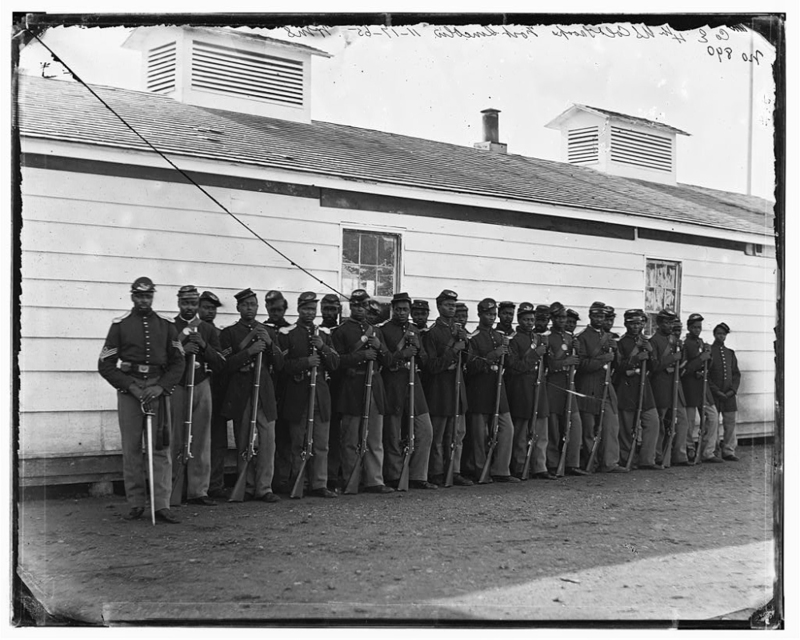 Colored Infantry Regiment, E Company, pose for a photograph at Fort Lincoln, Md., one of several fortifications ringing Washington, D.C., during the Civil War. Of course, 150 years after the war began, many Americans study the conflict in many different ways. Some get caught up in the leaders' personalities, or in specific battles that served as turning points in the war. "There's a group of people for whom that means obsessing over military tactics," Coates tells NPR's Steve Inskeep. But the risk of analyzing the Civil War that way, Coates says, is that it may simplify the conflict too much — reducing it almost to the level of a football game. And the danger he sees is that such approaches mostly focus on the white men who led the Union and the Confederacy. "African-Americans don't have the luxury of thinking about the Civil War as a sports event," Coates says. "We have to think about it as it is: as the event that gave us our freedom — or, I would probably actually amend that and say, the event in which we claimed our freedom. I would go so far as to put it that way." Coates says that in the past 30 or 40 years, "there's been tremendous progress" in how Americans think of the war. But for many, there's still disagreement about slavery's role in sparking the war, he says. "There's a kind of avoidance, where we haven't yet learned to confront the fact that this was a war for the establishment of a republic based in white supremacy," he says. "And it failed. And it's a very, very good thing that it failed." But that's also a difficult idea for many people to embrace, Coates says. "So many people have actual ancestors who fought in the Civil War," he says. "It's in so many of our bloods." If the country is still unable to agree on how to remember the Civil War, there's plenty of blame to go around, Coates says. Part of the reason for that, he says, is that the main goal for President Lincoln, and, later, President Ulysses Grant, was the preservation of the Union. After the war ended, Coates says, "The main priority became coming back together, forging a national myth." And in that process, he says, African-Americans were mostly left out of the story. "Its legacy belonged not to us, but to those who reveled in the costume and technology of a time when we were property," Coates writes in his essay. The time has come, Coates says, for black Americans to look at the war's history on their own terms. "At some point, we have to decide that we're going to actually interpret the war for ourselves. We have to make our claims." "This is Gettysburg," Coates says. "I mean, this is the seminal battle that made freedom real for this country." 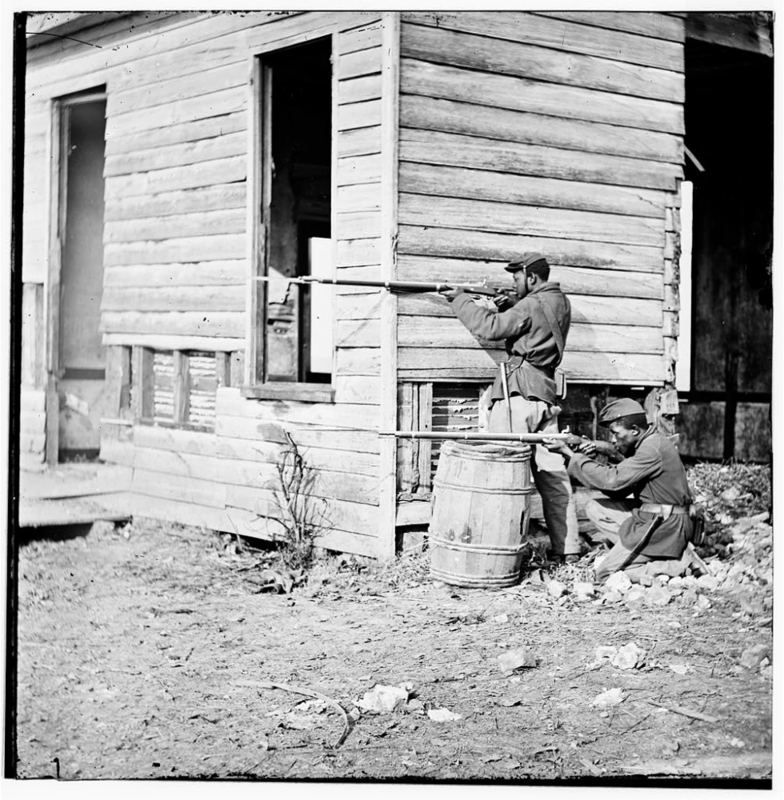 Two black soldiers man a forward watch station in Dutch Gap, Va., during the Civil War. Author Ta-Nehisi Coates says he has become a student of the war — and he's wondering why more black Americans don't join him. As for why that might be the case, Coates thinks part of the reason might be that black Americans' roles in the war are not represented in the same way as white Americans'. "If you tour the battle parks and you look at the monuments, they're dotted with monuments to the Confederate dead," he says. "I'm sure there's one somewhere, but I've never seen a monument to any of the colored troops who fought in the Civil War." Most of those battlefield monuments are paid for by the surviving families of fallen soldiers, or the members of the same military unit, who served years later. "At some point, I really believe that we have to claim the history for ourselves, and do part of that ourselves," Coates says. "I did a tour of Tennessee about a year ago, where the Civil War is very much alive. And I will tell you, in general — the places I went — the feeling about the Civil War is definitely different than mine. And yet, I was struck with this odd admiration — for the fact that they had not forgotten. They will not forget. "And so I was in this odd position of being totally opposed to their interpretation of the war, but admiring their effort to preserve history, and to claim it, and to own it. And I think, at some point, we have to do the same." Coates says that he plans for his article in The Atlantic to lead to a book about the Civil War. And he says that learning more about the conflict, and about the state of American society in those times, has clarified the issue for him. "I vaguely understood ... that the Civil War was about slavery" before studying that era of America's history, Coates says. But, he adds, "I didn't understand how much the Civil War was about slavery. The wealth of slaves, themselves, was worth more than all of the industry in America combined, in 1860." That is, when viewed as property, the slaves represented a huge portion of the U.S. economy. "It was by far the greatest financial resource in the country," Coates says. "I didn't understand that at all — but it immediately made clear to me why 600,000 people would die in that sort of way, and why the war lasted as long as it did, and why it was as ferocious as it was." For that particular community, for my community, the message has long been clear: the Civil War is a story for white people — acted out by white people, on white people's terms — in which blacks feature strictly as stock characters and props. We are invited to listen, but never to truly join the narrative, for to speak as the slave would, to say that we are as happy for the Civil War as most Americans are for the Revolutionary War, is to rupture the narrative. Having been tendered such a conditional invitation, we have elected — as most sane people would — to decline. In my study of African American history, the Civil War was always something of a sideshow. Just off center stage, it could be heard dimly behind the stories of Booker T. Washington, Ida B. Wells, and Martin Luther King Jr., a shadow on the fringe. But three years ago, I picked up James McPherson's Battle Cry of Freedom and found not a shadow, but the Big Bang that brought the ideas of the modern West to fruition. Our lofty notions of democracy, egalitarianism, and individual freedom were articulated by the Founders, but they were consecrated by the thousands of slaves fleeing to Union lines, some of them later returning to the land of their birth as nurses and soldiers. The first generation of the South's postbellum black political leadership was largely supplied by this class. Transfixed by the war's central role in making democracy real, I have now morphed into a Civil War buff, that peculiar specimen who pores over the books chronicling the battles, then walks the parks where the battles were fought by soldiers, then haunts the small towns from which the soldiers hailed, many never to return. This journey — to Paris, Tennessee; to Petersburg, Virginia; to Fort Donelson; to the Wilderness — has been one of the most meaningful of my life, though at every stop I have felt myself ill-dressed in another man's clothes. What echoes from nearly all the sites chronicling the war is a deep sense of tragedy. At Peters­burg, the film in the visitor center mourns the city's fall and the impending doom of Richmond. At the Wilderness, the park ranger instructs you on the details of the men's grisly deaths. The celebrated Civil War historian Bruce Catton best sums up this sense when he refers to the war as "a consuming tragedy so costly that generations would pass before people could begin to say whether what it had bought was worth the price." All of those "people" are white. For African Americans, war commenced not in 1861, but in 1661, when the Virginia Colony began passing America's first black codes, the charter documents of a slave society that rendered blacks a permanent servile class and whites a mass aristocracy. They were also a declaration of war.